Antares Parva, sighted at a thrift store that was teeming with sewing machines - there are three in this picture alone. Hermes 3000, 2nd generation, techno typeface. Lovely condition, too. As usual, it never takes long to come across a Hermes, but this Baby flanked by July 4-themed tumblers seems to have seen better days. 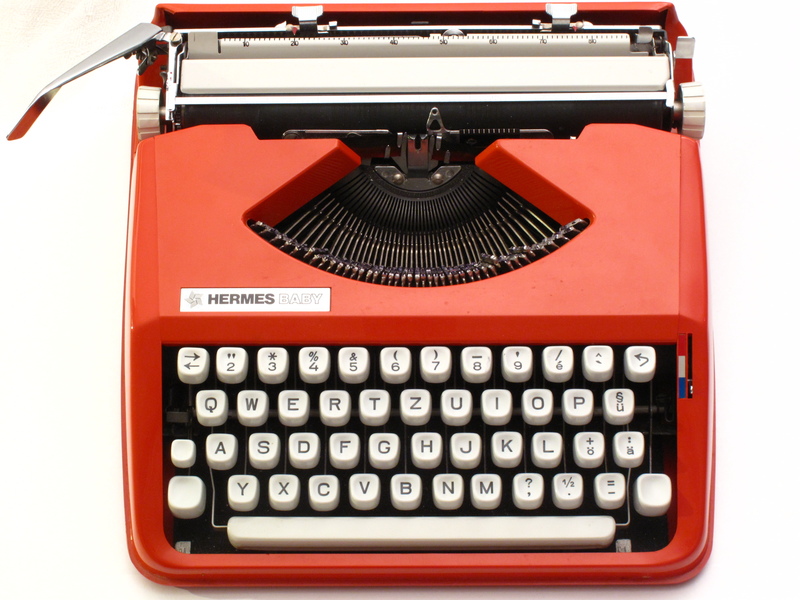 Olympia Traveller C, AZERTY keyboard. Another AZERTY - a Japy standard. 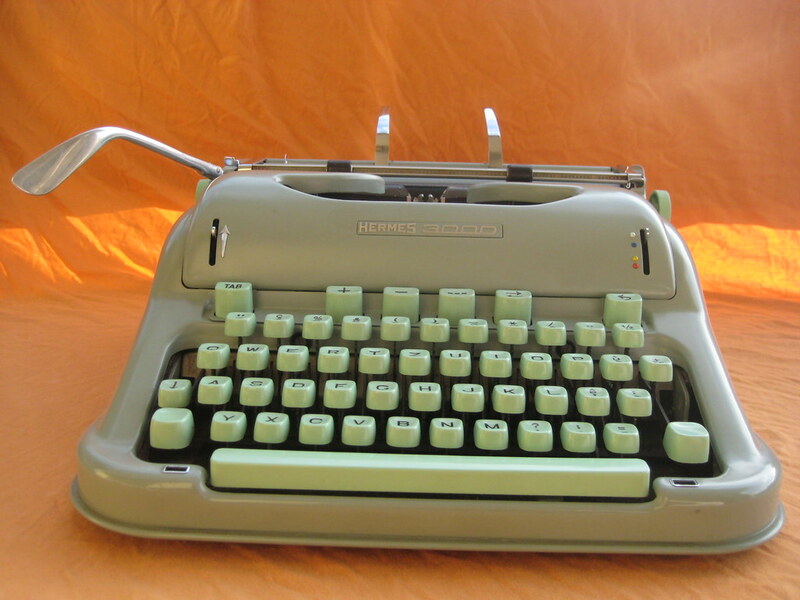 And yet another, an earlier generation with lovely green keys. I loved how this Hermes 3000 was presented, on top of an antique radio. Even the seller's beard seemed in keeping with his stall's theme. A closer look revealed a techno typeface - nice enough, but when will I ever find a script 3000? Not that I'm hankering for more machines, but I see so many of these but the script version is consistently evasive. 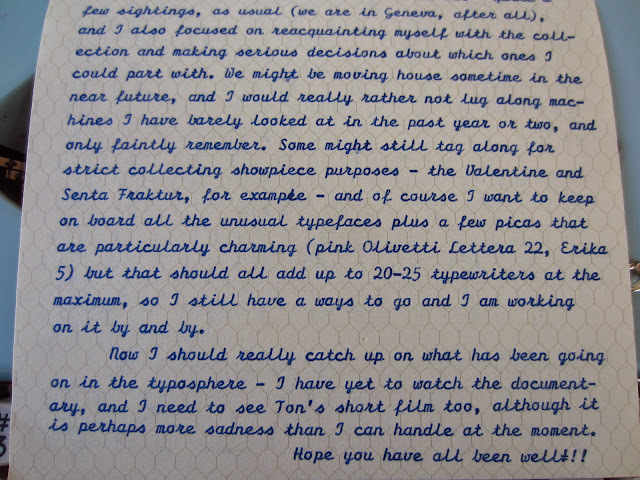 And a Lettera 25, with the accompanying satchel. This Olympia Monica was tempting - but moratorium, etc. Sigh. The seller of this Erika snapped at me when I took a picture and walked away, asking for a fee for the photograph. This has happened to me a couple of times in the past and it never gets less unpleasant. It takes me 2 seconds to take a picture - it really is not that big of a deal. Sadly, it's made me more self-conscious about taking photographs and I try to do it when the seller is distracted. This Royal Quiet de Luxe was lurking under a table and I snuck in a quick shot. I love that at thrift stores, that problem is nonexistent - the sales attendants are very relaxed and I examined this Remington Quiet-Riter at length (not that my pictures got any clearer; I'll blame this on poor lighting). Anyone got a "C" for this "Onsul"? At least it has a British keyboard, that's a plus. I'll leave you with a lovely sight I happened upon a couple of weeks ago: Geneva's very own street typewriter poet! She was using a Brother 220, typing poems on demand after requesting themes from the audience. Attracted quite a crowd, too, and everyone was eager to have their poem right. this. second! She seemed a tad flustered, but handled herself well regardless. 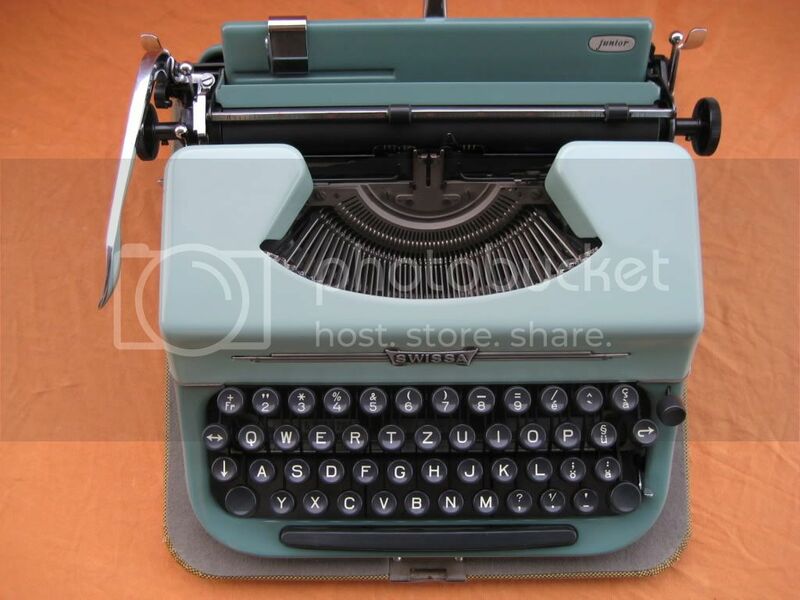 I love randomly coming across typewriters in use here - it is so rare!